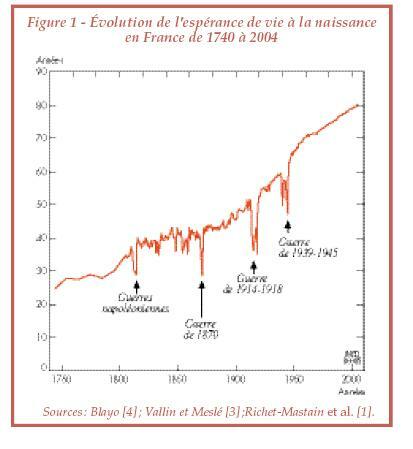 For the past 250 years, life expectancy has increased with amazing regularity (interrupted only by war) at a rate of one trimester per year. 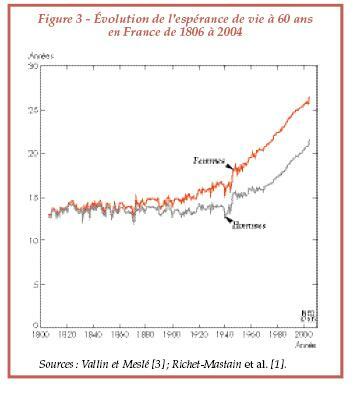 It is interesting to note that until the 20th century, improved life expectancy was linked exclusively to better survival rates in the early years, whereas in the past century, the life expectancy in later years has significantly increased. Again, it is striking how close to a straight line these graphs are. I have also read that this increasing life span has been accompanied by an increasing healthy life span, i.e. older people are, for the most part, in good health, and it is only in the last year of their lifes that their health becomes really bad. So it's not a question of (ab)using medecine to extend the life of severely ill or weakened patients: we live longer AND better. The obvious question is - how long can that last? - the biggest worry these days is linked to obesity, which has been growing at a rapid pace in most Western countries (and in some thrid world countries as well), with the US leading that sad race. Obesity is associated with a number of diseases and, as a recent study (mentioned in the above link) states, could be a cause of declining life expectancy, for the first time in almost 3 centuries. There are some who believe that if you manage to keep yourself alive and in good health over the next 20 years, you may have a shot at living forever. living forever is maybe an oxymoron. If living is defined as to "not being dead" living forever takes away that definition. I don´t think I would like that for myself. Good stats, Jérôme. Nice findings indeed. 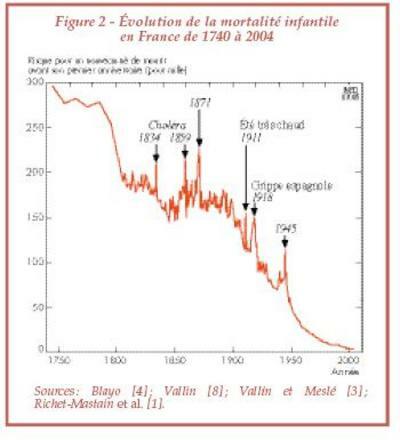 Though, I won't say the increase was that linear and regular from 1760 to 2000. It was close to stalling during a good part of 19th. And I'm quite amazed that the 1870-71 crisis (war+commune) was so costly. What one can take from these stats is that during 1760-1940 timeline, life expectancy increased thanks to lower infant mortality, and since 1940 it increases thanks to better health of adults and elders. Seeing the infant mortality, I can only guess that the Revolution was quite effective in improving the life of the mass of poor people in France. The last graphic is quite telling (in the PDF file, which you didn't include here). Apparently, infectious mortality dropped severly in mid-20th (logical, thanks to penicillin), but all the cadriovascular mortality dropped big time and constantly, too, since 1940 - which is a bit surprising to me. Also of interest is the totally flat level of cancer mortality. So, yes, it's far more curable now, but it may also show that the scare over microwave ovens, TVs and the like giving cancer were a bit over-the-top. As a side-note, quite often we see people outraged that proportionally, car accidents and suicides are the biggest causes of youth mortality. Well, once you've eliminated infant mortality and war, there's no surprise that what were once minor causes in youngsters' mortality now take the lead. Just like cancer being relatively minor compared to infections in 1900, but taking the lead now that infections barely kill anymore. I of course fully agree with smoking. With at least as many women smokers than men, they'll soon fall to a life expectancy similar to men's, I fear. Your mention of elder people having a quite good health and good life is spot on. This is my main point with health overall (and kind on topic with the whole Schiavo circus); imho, the goal isn't to survive for as long as possible, because just survival is unworthy of a human being. The key is to actually live, which means having a decently independantly functioning body. I'd rather go Hunter Thompson's way than end up like Terry Schiavo or even Ronald Reagan and other elder people with terribly debilitating end-life illness. I've also seen some stats that tend to show that for the average Westerner, half the healthcare costs are due to the last year of life. The trouble isn't that people living longer means they'll cost more to Social Security; this can be fixed in a way or another. My biggest worry would be that there'll be a runaway effect on the healthcare if everyone lives long and feels entitled to the best treatment possible just to live 10 or 8 more months, though they're already 90+. But I may be completely wrong in my impression here, of course. Yet I still think that if Bush had any brains, this is where he should investigate and put some research (both in consequences of very long life expectancy and of better medicine), rather than try to scam people by privatising SS. I wouldn't mind a shot a living forever (or to, say, 1000) just to catch up on my reading. But if we're all going to be "downsized" or "laid off" or "made permanently redundant" at 55, then how will we support ourselves for the next 945 years? My biggest worry would be that there'll be a runaway effect on the healthcare if everyone lives long and feels entitled to the best treatment possible just to live 10 or 8 more months, though they're already 90+. My -unscientifical- personal evidence on this says that old people do not want these treatments. The are "done" on them. Most would probably like to have no pain and a some smiles and fall asleep. But the medical machinery is not prepared to make it this easy. If we all lived to be 1000, how far would the UN have to revise their estimates of world pop in 2020? The reason we die is to make room for our kids. The US life expectancy stats. obscure much. The US has the highest expenditure in health care in the world per capita ; and the largest uninsured / untreated or poorly treated pop. pc in the developed world. It is, of course, a class society, and this goes some way to explaning the stats. (The poor are shunted aside, get desperately ill, are no treated in time, starve or don’t eat properly, die of debt and despair, etc.) Capitalism also sees to it that waste, inefficiency and corruption are endemic. Hospitals pay ridiculous / extavagant prices for anything at all, as they are locked in a cycle of business cronyism, paid for, ultimately, by...employers and patients, -- all of them vulnerable. There is no ‘free market’ in that area, though many districts and even states have done their best: but the pharma companies (and many others on the gravy train, medical equipement, doctors, cleaners even) and local dignitaries (often men in white coats or closely affiliated, such as heads of labs, and investors: all this is always profitable...) win out. One factor particularly is obscured: Homicide. It is not medical, but societal. Prison life contribues to those stats. Yeah Blackie, we could go on and on about the prison system here (USA) and how monies are justified for more prison space while cut for social services. In a similarity to medicine and insurance and a number of other fields, the money goes to those who have power of influence and not to those who need it. Free market. An interesting side effect of the extension of longevity is that our life cycles seem to expand in order to fill our probable lifespan. It's not that you grow up, mature, get productive & get old as always but then keep on living, but rather that it takes you longer to reach each stage. My father at my age was older than I am now. When I was my daughter's age, I had seen, done and thought more than her, in spite of the greater facilities she how enjoys (which perhaps explains our nagging, "When I was your age..."); but when she went to Sweden she had trouble relating to girls her own age because they seemed too childish. This is visible even inside the same society: people whose life expectations are shorter tend to naturally evolve & mature faster. Not to mention what people in previous centuries were able to accomplish within a 30-50 year lifespan, having died at a point when we are just beginning. If Shakespeare or Da Vinci had lived twice as much, would they have been twice as productive? (No, I won't mention Mozart, that's unfair.) Somehow I doubt it; they would just have taken more time to come up with the goods. There may be a compensatory mechanism at work here. The extension of life presently springs basically from the quality of medical assistance, which is not distributed evenly. But the time framework that defines start of productive life & retirement age is more or less fixed. Therefore, affluent people tend to enter productive life later and retire with better incomes in their prime - in fact, it's quite usual for retired professionals to keep working for more 15-20 years. The poor, on the other hand, retire when they are drained and die soon afterwards. Therefore, it could be concluded that the poor are in fact paying for the leisure of the privileged. Nothing new here, of course, but perhaps there should be a mechanism to take in consideration the fact that people who earn more are expected to live longer and, therefore, should retire later. By the way, if my theory of expanding development cycles is true, then perhaps when immortality comes (and it will come, although probably not so soon) we may have 100-year-old adolescents roaming the streets and listening to bicentennial Britneys... hmmm, I'm having second thoughts about that Immortality Plan, can I get a refund? so the maturity of a person would be related not to the time lived but the expected time left to live, and thus how stressed you are to have time to do everything before you die? Interesting. Reminds me of Heinleins book where people had been breed on longetivity, although in that one while they stayed childish (also from the social factors of having your great-great-grandmother around and such) longer some eventually started to mature. And then they were really maturing beyond mankinds inherent childishness into something uber-menschlish. I guess Heinlein had his hopes about a better future too but distrusted mankinds ability of getting there. I state for the record that I think life expectancies will start to drop (global warming, peak oil, peak fish, crazy people in charge of hugh weapons arsenals, you know the list) and not continue that increasing trend. Thus I think it will be a mote point if it is desirable to live 1000 years. Given the choice of having my body not grow old and frail but keep on working as I does now, I would take it. But as it will not happen it is irrelevant.